Grain size plays a key role in controlling the mechanical properties of the Earth’s mantle, affecting both long-term flow patterns and anelasticity on the timescales of seismic wave propagation. In turn, the deformation in the Earth’s mantle also affects grain size evolution. However, dynamic models of Earth’s convecting mantle usually implement flow laws with constant grain size, stress-independent viscosity, and a limited treatment of changes in mineral assemblage. In “The importance of grain size to mantle dynamics and seismological observations”, Dannberg et al. (2017) use the community mantle convection code ASPECT to study grain size evolution in the Earth's mantle. The presented geodynamic models include the simultaneous and competing effects of grain growth, dynamic recrystallization resulting from dislocation creep (decreasing the grain size), and recrystallization at phase transitions. They show that grain size evolution drastically affects both rheology and the dynamics of mantle convection. Changes in grain size alone can lead to lateral viscosity variations of six orders of magnitude in the upper mantle, and control the shape of upwellings and downwellings. ... read full article J. Dannberg et al., 2017 doi: 10.1002/2017GC006944. Zenodo helps researchers receive credit by making their research results citable. This free services archives data and software and its associated metadata. Research products are assigned DOIs and your citation information is passed to DataCite and other scholarly aggregators. CIG uses zenodo to assign DOIs to its software and maintains a Zenodo Community to easily find research products in geodynamics. Don't forget to join our collection when entering in your metadata. Please feel free to contact us for more information on using zenodo for your research. 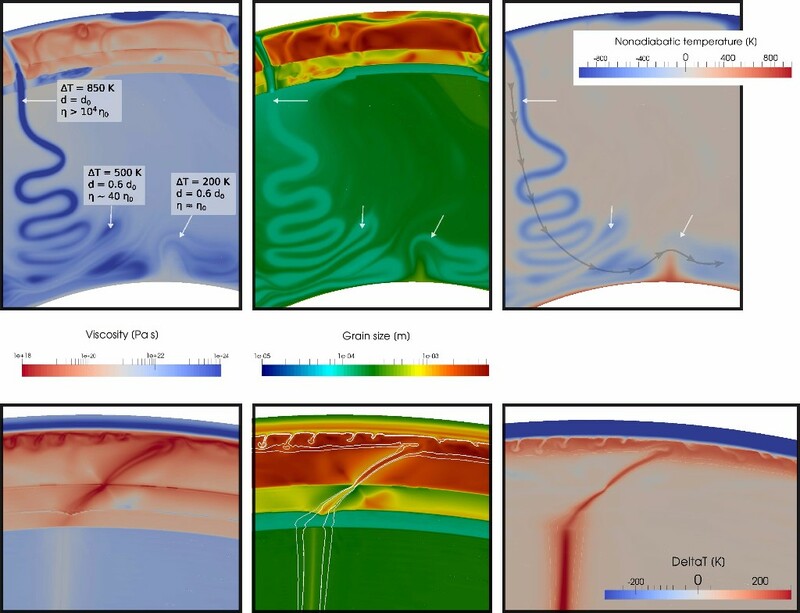 Shape and dynamics of subducting slabs (top) and mantle plumes (bottom) in models with dynamically evolving grain size. Snapshots show viscosity (left), grain size (center) and temperature (right). 2017 Elections are now open for positions on the Executive and Science Steering Committees. Candidates for the EC are Susanne Buiter and Carl Tape. Candidates for 3 positions on the SSC are Chris Harig or Gabriele Morra, David Ham or Moritz Heimpel, and Jessica Irving or Ying Zhou. Candidate statements are available online. Contact your member representative to vote. Many thanks to EC member Omar Ghattas and SSC members Jed Brown, David May, and Carl Tape for their contributions to the community and to the Nominations Committee, Clint Conrad, Wolfgang Bangerth, Ved Lekic and Sabine Stanley for presenting an excellent slate of candidates. Looking for talks in geodynamics at AGU? Visit our website to see the latest research your CIG colleagues are presenting. Do not forget to email us your presentation information so your research can be highlighted on this list. Congratulations to Julianne Dannberg for winning the KlarText Prize for Science Communication. The KlarText prize is awarded to scientists who have finished their dissertation and can explain their research to a non-scientific audience in German. Read her winning entry Up and down in the mantle.